Between October 1st and October 16th, 2013 the United States government shut down. This forced over 800,000 employees into furlough and more than a million others continued to work with no knowledge of when they would be paid. All non-urgent government payment were suspended as the nation took a long, and slow, deep breath. The crisis was dissolved, or at least delayed, through the suspension of the federal debt limit. Nevertheless, the events brought the discourse around federal debt in the United States to the forefront. Statutory limits on federal debt are not new, what has changed since 1940 is the amount of the debt limit. The debt limit has been raised due to increasing public debts, a trend that has accelerated since 1990. Federal debts have grown due to persistent budget deficits. Simply put, when the government spends more money than it gains from tax revenue and other sources there is a budget deficit. Such deficits add to the public debt as funds must be borrowed in order for all components of the budget to be covered. Public debt is also costly to the public as interest payments absorb government resources that could otherwise be used for additional public services. A look at the interest expense on public debt in the United States shows that interest on public debt totaled 528 billion U.S. dollars in the United States in 2016. That is more than double the federally allocated funding for education and related programs. Due to this persistent financial outlay, high levels of public debt are seen as being restrictive on growth and the economy as a whole. As such, countries generally try to keep their level of public debt down. 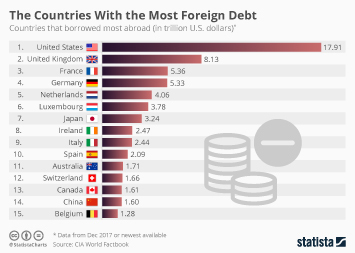 The United States has the unfortunate accolade of being included in the 20 countries in the world with the highest public debt to gross domestic product ratio. Moreover, high levels of public debt can also lead to deep financial crises, as the experience of the Greek economy has shown. Public debt of the U.S.